Ann Thrupp has been named managing director of the California Sustainable Winegrowing Alliance. Photo by Jeff Kan Lee / Press Democrat. When Ann Thrupp was in eighth grade, she worried about world hunger while other students fretted over what they’d wear to the dance Friday night. Long before it was fashionable, Thrupp, now 47 and manager of organic development at Fetzer Vineyards in Mendocino County, talked about sustainable food production systems. It’s a multifaceted approach based on what she calls the three E’s. “Environmental responsibility, economic viability and social equity,” said Thrupp, rattling off the tenets of sustainability like a kid reciting her ABCs. The three E’s have guided Thrupp for the past 25 years as director of sustainable agriculture at the World Resources Institute, a Washington, D.C., think tank, and most recently at Fetzer. Now they’ll play a key role in Thrupp’s new position as managing director of the California Sustainable Winegrowing Alliance. It’s a nonprofit organization established by the Wine Institute and the California Association of Winegrape Growers to make California the world leader in sustainable grape growing and winemaking by the end of the decade. The movement was born in the late 1990s to address a public backlash against the wine industry. The unprecedented vineyard planting boom in the 1990s caused outrage from Santa Barbara to Cazadero as grapevines marched up hillsides or over previous oak woodlands. Thrupp said the program is based on the “Code of Sustainable Winegrowing Practices,” which offers guidelines for the best environmental practices in vineyards and wineries. Thrupp said the code, already embraced by more than 50 percent of the wine industry, is not “green washing,” a marketing scheme that uses environmental rhetoric rather than sound actions to create an image of environmental awareness. “If it was green washing I wouldn’t have taken the job,” said Thrupp, who calls herself an “agroecologist,” a term describing the connection between environmental and agricultural systems. When not running to meetings or airports, Thrupp, trim and athletic, is a long-distance runner. It’s an activity she enjoys with her partner, Bill Leland of El Cerrito, who also shares her passion for community development and environmental stewardship. Around Fetzer, Thrupp is known as “Dr. Ann,” a title honoring her doctorate while connecting with her friendly, outgoing personality. Becoming sustainable, Thrupp said, means producing grapes and making wine in ways that don’t deplete resources or pollute the environment. It’s about reducing the use of toxic chemicals, conserving water and preserving wildlife habitats. It’s also about providing fair wages and decent working conditions for vineyard workers and winery employees. “It’s a business model that’s based on the triple bottom line, which is the three E’s,” said Thrupp, who will continue to work at Fetzer Vineyards while serving as managing director of the alliance. Thrupp was named to the position last month to fill the position previously held by Jeff Dlott, who is stepping down. Leaders said Thrupp’s expertise in sustainable agriculture will build on the momentum of the program, launched in 2002. “Ann Thrupp’s work on the international stage has groomed her for this important position. Her extensive background in sustainable agriculture will benefit our industry and all of California,” said Karen Ross, president of the Sacramento-based California Association of Winegrape Growers. During her career, Thrupp has worked with banana farmers in Costa Rica and coffee growers in South America. Before joining Fetzer in 2003 she was a policy specialist with the U.S. Environmental Protection Agency, working closely with the wine industry on sustainable agriculture. 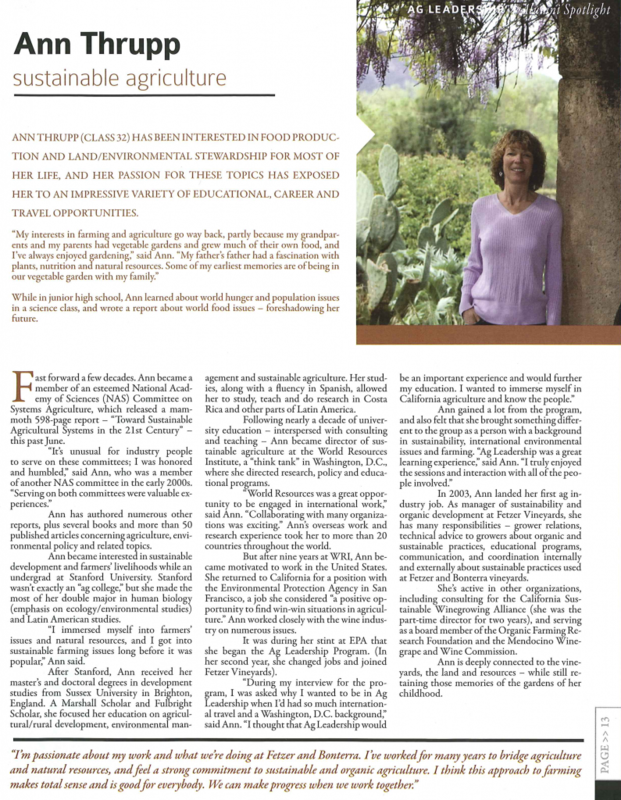 Guiding the Winegrowing Alliance is a dream job for Thrupp, whose life mission is to make a difference in what she calls the “intersection of agriculture, economic development and social justice.” She believes the wine industry’s environmental commitment will guide other agricultural commodities, such as corn, carrots or cattle, down the path of sustainability. “It’s rewarding to partner with others to develop ideas, actions and changes that embody respect for nature and humankind while also enabling successful economic enterprise,” Thrupp said.